Staying connected while on the go can be a pain. But it’s necessary for those of us who work on the Internet, play online games, or want to stay in touch with their friends and family. A ton of manufacturers started making portable Wi-Fi routers to alleviate the issues associated with getting online while on the road. Whether you’re in a hotel, airport, or at a convention center or public place, portable Wi-Fi routers are a great way to keep your devices connected and secure. What are portable Wi-Fi routers? The first thing you need to understand is a portable Wi-Fi router is not a hotspot. A portable hotspot requires a data connection from a wireless service provider like AT&T, Verizon, or T-Mobile. Portable routers act just like your home Wi-Fi router. They connect to a public Internet connection and share it with your devices. This provides an extra layer of protection and lets you build a private network anywhere you travel without the need for your large home router. Because of the small size, a portable router doesn’t have the same range as a home router. It’ll cover a hotel room, but it’s not going to have a strong signal beyond that. This is a great security feature. They also typically have a built-in firewall, adding another layer of protection. And most of these portable routers are the size of your wallet or smaller. 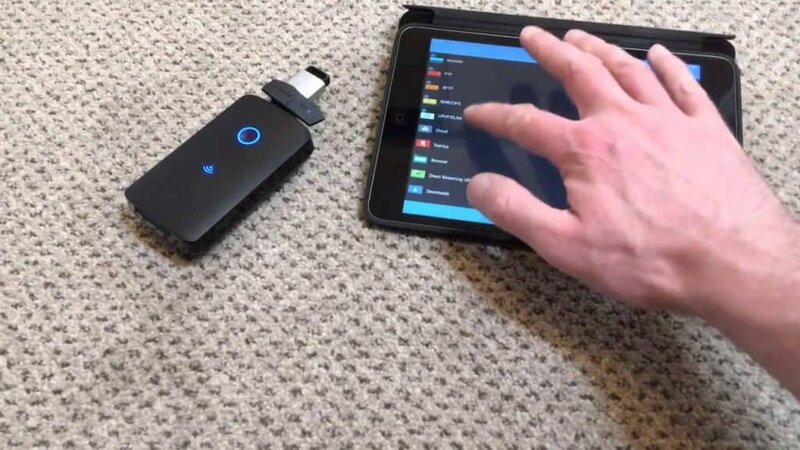 This makes them a highly compact and convenient way to get multiple devices online and create a shared connection. How do you use a portable Wi-Fi router? Portable Wi-Fi routers work with laptops, smartphones, tablets, and any IoT devices. It provides a single Internet connection for all your devices. Although most pocket routers run on battery, some have AC outlets. Many also come with USB ports and SD card readers, letting you create shareable network storage. They’ll often include an ethernet port. This is handy in hotels when hardwired ethernet is available. You can also connect to public wireless networks. In order to connect to a cellular network, you’ll need a cellular modem from your carrier. Portable routers do not have a SIM card, as they’re meant to be used as Wi-Fi routers, not cellular hotspots. To connect, simply power the router on, and find the network from your device. Enter the security key (the default SSID will be listed in the device documentation), and you’ll be connected. On a public Wi-Fi network, you’ll need to go through the extra step of connecting the Wi-Fi router to the public network. The network will reroute you to the page necessary to complete this step. That’s all there is to it. Now you can connect your other devices to the router and share one secure connection. There are several pros and cons of portable Wi-Fi routers. No technology is perfect, and you need to be aware of true capabilities of these devices. They have nearly as many downfalls as selling points, so pay attention. Security – A firewall is a powerful defense against hackers and other cybercriminals. While most talk of Android security revolves around firewall apps, a portable router has a built-in hardware firewall. These firewalls can be configured to block off open ports, anonymize web traffic, and prevent malicious programs from affecting your devices. When connecting to a public Wi-Fi network, portable routers act as a VPN, cloaking your traffic from public view. Some even route traffic through software VPNs or the TOR network for an additional layer of security. If you’re interested in security, a portable router is a must-have for your travel packing list. Portability – Portable Wi-Fi router weigh in the range of one to ten ounces. They’re small enough to fit in your pocket and can be easily carried on your person, in a purse or backpack, and in carry-on luggage. Anywhere you can carry a smartphone, you can bring a wireless travel router. This portability makes portable routers useful, despite often having limited range. For example, many Wi-Fi networks at airports, coffee shops, and other public places will only grant you one connection. With a portable router, you can share that connection with all your devices. Price – Portable Wi-Fi routers typically range in price from $15-$50, and you can easily find a decent buy in the $30 price range. This makes them considerably cheaper than home Wi-Fi routers that usually cost $80, upwards of $300. For the cost of a couple Starbucks lattes, you’ll add privacy and security to your mobile connections. It’s a great value for the price. Also, many also have other functionality like battery banks. If you’re already going to be spending $25-50 for a battery bank and another $10-$30 on an SD card reader, it only makes sense to buy just the one device and add Wi-Fi and Ethernet connectivity to the mix. Convenience – Not only do portable Wi-Fi routers act as routers and bridges, but they also have other functionality. Many can be used as portable USB battery banks to charge devices, portable media-streaming servers, wireless file-sharing servers, and more. As described above, you’ll easily spend the same price on each of these other devices. Portable routers bring all that functionality into one small device. This makes these multi-purposes devices must-haves for anyone who regularly travels. But the functionality doesn’t just stop on the road. A portable Wi-Fi router can also be used at home to extend the range of your home Wi-Fi signal in places where it’s having trouble. Speed – Because of their small size, portable wireless routers can bottleneck network speeds. They typically only support USB 2.0, and many only support 802.11n or lower. This can cause occasional buffering issues, especially when streaming UHD video on a larger screen through a service like Netflix. Also, most travel routers only support the 2.4GHz range, which can get crowded in public places, throttling your connection speed. Be sure to check connections before purchasing a portable router, or you may get stuck with older technology. Look for support for 5GHz, 802.11ac, and USB 3.0 when possible. Reliability – Because they run on battery power and have smaller antenna, the reliability of a portable Wi-Fi router can’t compare to a larger home Wi-Fi router. Be aware that you will experience intermittent connection issues, especially in connection settings that aren’t ideal. If you’re going to be spending a lot of time online, be sure to plug your portable router into an electrical outlet. This will ensure you don’t get disconnected at an inopportune time. Range – The range on a portable Wi-Fi router is much lower than a multi-antenna home router. Moving more than 20 feet away or on the other side of the wall will severely limit its TCP throughput. Physical objects between the router and your devices can have detrimental effects. Be sure there’s a clean line of sight between your portable Wi-Fi router and the devices you’re connecting to it. This will mitigate complications caused by dropped connections. Of course, as mentioned previously, this shortened range also helps secure your network. People routinely hack into Wi-Fi networks, but they need to be in range to do it. A portable router limits your range, so it’s less likely your network will be picked up by malicious actors. Now that you understand how portable Wi-Fi routers work, it’s time to start shopping for one. There are dozens on the market, and it’s hard to filter through the noise marketers put out there. Lucky for you, I have some personal experience using many portable Wi-Fi routers, even obscure ones like Anonabox, the portable Tor router. The downside of Anonabox is that it supports HMA VPN by default, which is known to be the absolute worst VPN for staying anonymous. Here are the top five portable Wi-Fi routers on the market. 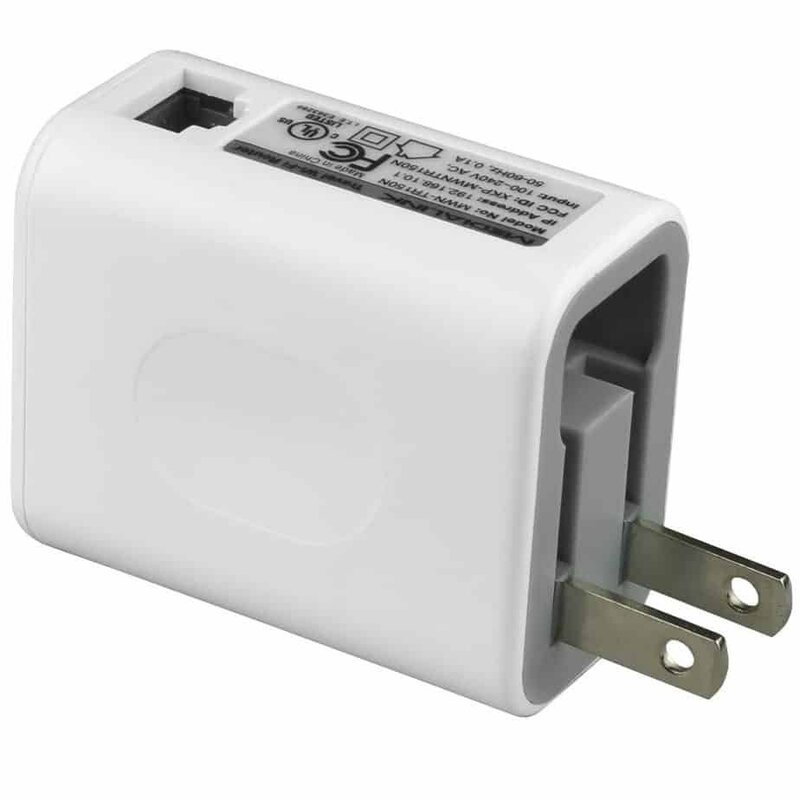 The MediaLink N150 looks just like a USB power adapter with foldable AC prongs. Measuring only 2 x 2 x 1.5 inches and weighing 2oz, it’s one of the smallest portable Wi-Fi routers on the market. However, it still functions as a wireless router, access point, or wireless client on 802.11BGN networks with 2.4GHz frequencies. It’s missing a USB port, so you can’t use it as a media server, but it does have an Ethernet port and can transfer wireless data at 150Mbps. It’s also the cheapest portable router on the market worth buying. Setup is a breeze, and it remembers stored network settings when powered off. It’s not as robust as other portable routers on this list, however. It doesn’t support OpenWRT, static IP, local DNS, VPNs, and other features power users will want. The GL-AR300M is powered by a Qualcomm QCA9531 SoC, 650MHz CPU. It has 128MB RAM and 128MB nand flash memory. This makes it a powerful travel router with 300 Mbps transfer speeds. You can also get it with two small external antennas that greatly improve its range. 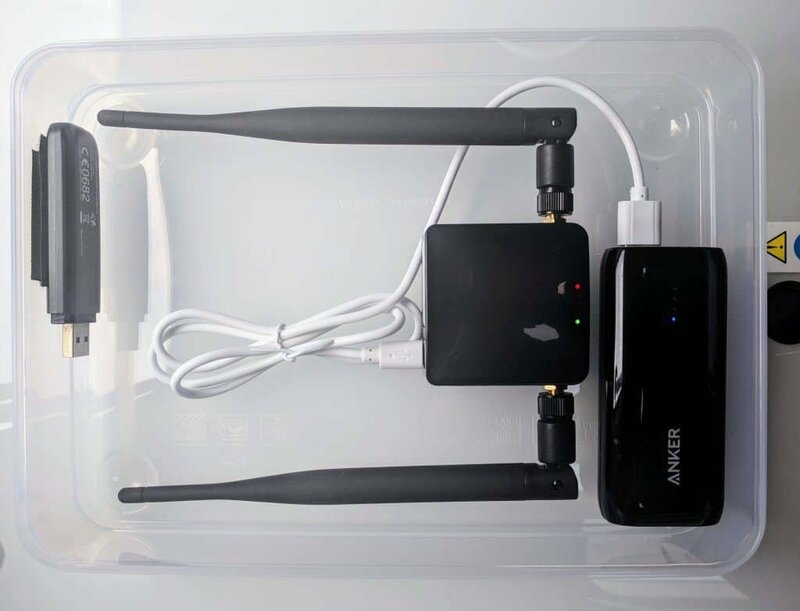 This portable Wi-Fi router has OpenWrt pre-installed and supports UART and PCIe interfaces. It runs on 2.4GHz frequencies, and unlike other portable Wi-Fi routers, it includes two Ethernet ports. Adding an additional layer of security, it supports both OpenVPN and the Tor client, which is easily turned off when you want to stream Netflix or Hulu. The GL-AR300M is easily the most secure portable router if you’re working on sensitive data (or are just paranoid). 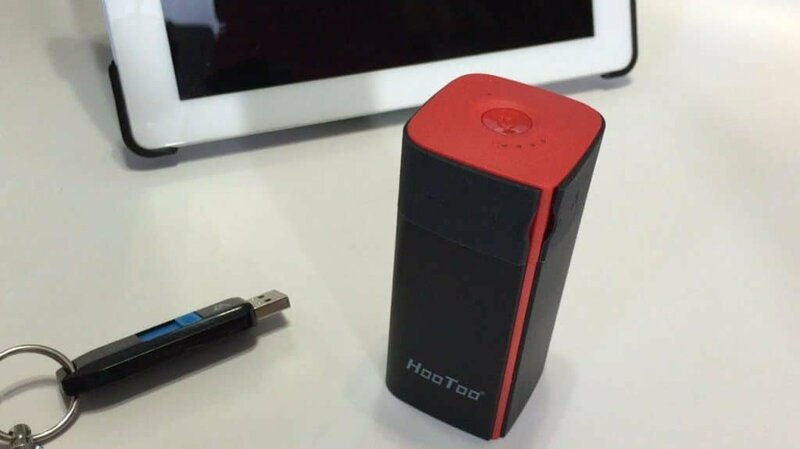 The HooToo TripMate Titan is packed with features. It functions as a 10400mAh, 2A portable battery bank, and a portable 802.11 BGN, 2.4 GHz Wi-Fi router. Its MTK7620 chipset allows it to act as both an access point for wired connections or a Wi-Fi bridge. TripMate Titan measures 1.65 x 1.65 x 3.74 inches and weighs 8.8oz. It makes wireless transfers a breeze and supports Chromecast streaming. Up to 5 connected devices can access any connected USB storage device simultaneously with no lag. It can also support a four-port USB hub to extend your media streaming options. Speeds cap out at 150 Mbps, however, so don’t count on it for watching 4K UHD Netflix movies on a large screen. 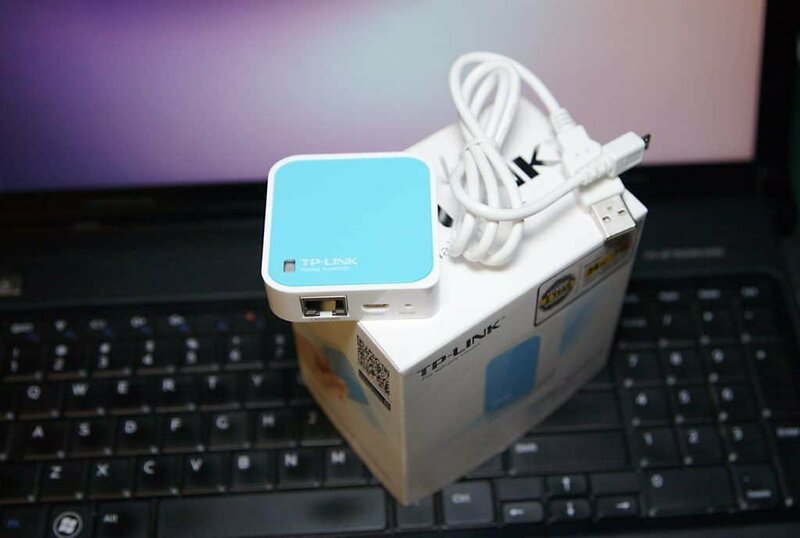 TP-Link is a Chinese networking manufacturer that’s been in business since 1996. The N300 Nano Travel Router is one of the most portable Wi-Fi routers on the market and has the best range. It measures 2.2 x 2.2 x 0.7 inches and weighs 7.2 oz. Still it manages to fit a ton of functionality into such a compact package. The N300 is powered by micro-USB and can draw power from any USB port on your computer, laptop, battery bank, or even a smart TV or DVR. Or you can use a USB power adapter to plug it directly into a power outlet. It supports 2.4 GHz frequencies with 300 Mbps throughput speeds. It can be used as a router, hotspot, range extender, access point, or as a wireless client to turn your wired video game console or smart TV into a wireless one. In WISP mode, it acts as a repeater that can extend the range of your home Wi-Fi network, making it a handy device, even if you don’t travel. The RAVPower FileHub Plus is a personal favorite of mine that I’ve owned now for 6 months. It’s a 3-in-1 device built for traveling. It’s a media streaming NAS device with a built-in SDHG/SDXC card reader and USB port capable of reading external hard drives up to 4TB. It also supports DLNA, so you can stream directly to a Chromecast-enabled device or smart TV. On top of that, the FileHub Plus is a portable wireless router with an Ethernet port that can turn a hardwired connection wireless. It supports 802.11 BGN, and this multi-band functionality lets you connect your devices without interference. In addition, it’s a 6000mAh, 5V/1A portable battery bank. Whether acting as an access point, bridge, or router, it supports PPPoE, static, and dynamic IP. Also the MTK7620N core built-in chip provides all the charging power you need for charging any Android or iOS device. It’s also small, at 3.8 x 2.1 x 1.1 inches and weighing only 5.4 oz. You’ll be hard-pressed to find a better value for $40.